Based in Washington, DC, Client is a leading marketplace to buy and share the best things to do in major international cities – or wherever customers are. They provide a trusted, convenient source for finding value on everyday items and activities and identifying novel, enriching and fun experiences for you to enjoy and share with your friends. They help local and national businesses grow by introducing them to high-quality new customers and deliver compelling and cost-effective marketing solutions for businesses large and small, providing them with the tools to make their members regular site users. They have more than 60 million members around the world and have sold more than 205 million vouchers to date. Client employs 150-200 inside sales people to call both cold and warm leads to see if they are interested in utilizing their international marketplace to feature their offerings and services. Client approached App Maisters to integrate their phone system, Fonality, with Salesforce.com by bypassing Fonality features in order to help drive greater productivity among the sales team as well as to gain greater visibility (e.g. reporting) into the inside sales outbound call metrics. Along with reporting measures, the tool must provide multiple contact phone numbers, support the capability to transfer calls, posses a keypad for custom dialing, also support inbound call capabilities, easy to use and has a flexible interface. Build CTI systems that integrate with Salesforce without the use of CTI adapters. 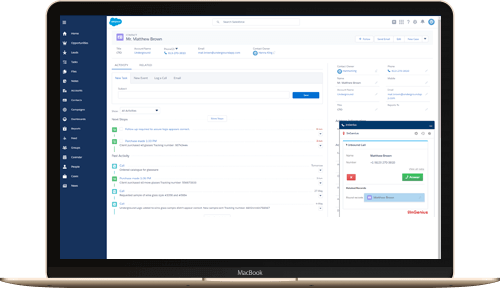 Create customizable SoftPhones (call-control tools) that function as fully integrated parts of Salesforce and the Salesforce console. Mozilla® Firefox®, Apple® Safari®, or Google Chrome™ on Mac,Linux,or Windows machines. Use standard SOAP API calls to add functionality to a composite application that processes only one type of record at a time and does not require any transactional control.